BoBunny recently released three new collections: Pincushion, Winter Woodland and Head Over Heels. Today I am sharing the first project I've created using their new Pincushion collection, a layout with photos of my sweet nieces at another of my nieces' weddings. She was too adorable blowing bubbles to wish the newly wedded couple a happily ever after! This range is full of sweet doilies, hearts and banners. It really brings thread count and backstitching to life in a fun and trendy way. The color combination is on point as well with its minty greens, grays, peaches, creams and whites. Happiness is definitely handmade when you create with BoBunny's Pincushion collection! I added some simple machine stitching to accent the edge of the main background paper. The tape measure strips were cut from the Pincushion Measurements paper. I cut strips that matched in color and then overlapped them slightly to give the illusion that they are wrapping around the page. The title piece was created by combining a sticker from the 12 x 12 Combo Sticker sheet, a piece of the Noteworthy and a Layered Chipboard Sticker. If you are looking for more Pincushion inspiration, make sure you check out the BoBunny blog this week for cards, layouts and more using this sew sweet collection! Love the colors and the doilies. Great layout ! This is gorgeous!! 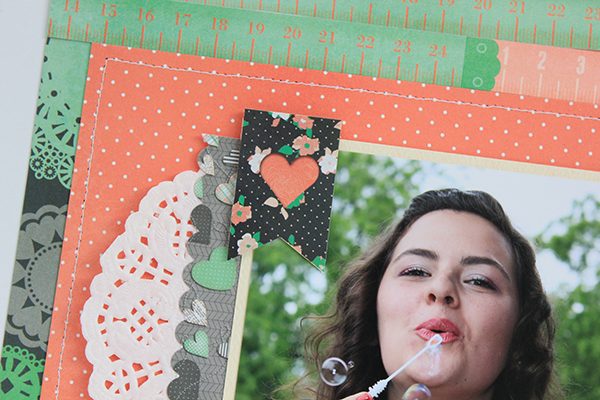 I loveeeeeeeeee the colors in this collection, the doily paper and those sweet photos!!!!! Beautiful collection and I love the way you mixed the colors and patterns Juliana! And such cute photos of your niece! Ha! Fun photos and I love the colors!